Once every year, the inner sci-fi geek in all of us gets a chance to reclaim a sliver of that wide-eyed wonder of youth, and unite with like-minded souls in a nostalgic embrace of the pop-culture phenomenon that imbued an entire generation with the solemn precept, “may the force be with you.” Thirty-seven years after the original Star Wars movie hit the big screen, May the 4th has become a force all its own—a day fans across the world come together to pay their respects to the galaxy’s most culturally significant space drama (apologies to Star Trek fans) and to celebrate its enduring legacy. The amplifying effect of social media has only intensified the day’s popularity, raising awareness among casual fans, while inspiring new generations of Star Wars disciples. But May the 4th has become more than just a commemoration for the young at heart. It’s also a time when marketing managers begin thinking up innovative ways to honor the Star Wars legacy. Increasingly the day has become an opportunity for Fortune 500 companies—eager to connect with the movies’ legions of adoring fans—to link their brands to the Star Wars mystique; a fact that’s becoming more apparent with each passing year. Here’s just a small sampling of what some companies have done to mark the day on social media. Paying homage to the Star Wars universe is nothing new. The franchise is famous for inspiring fan-created content from all corners of the universe; everything from street art to homemade short films. And the vast majority of it is unauthorized. The practice is so widespread that George Lucas, the creator of Star Wars, was forced to embrace it officially rather than risk alienating the loyal fan base that helped turn his obscure space opera into a cultural movement. However, as Jedi Master Yoda was keen on saying, “always in motion the future is.” Changing the times are, and circumstances are very different now than when the original Star Wars trilogy was in its heyday. For starters, the Star Wars properties are no longer owned by Lucasfilm, Lucas’ eponymous production company, but by The Walt Disney Company, who purchased Lucasfilm in late 2012 and has since assumed the ambitious task of evolving the franchise for a new audience by investing heavily in its future success. For another, the power of the Internet and social media have taken the production and distribution of fan content to levels that not even the most force-sensitive Jedi could have foreseen in the early 1980s. Long gone are the days when only the kid down the block with the Boba Fett jet pack could share in your Star Wars obsession. Nowadays fan sites can generate huge cult followings, and fan films, fan art and remixes and mash-ups can rival the quality of the genuine articles. While this has unleashed a new wave of amateur creativity that in many ways has been good for the movie business—generating buzz and expanding interest among the general public—it’s also precipitated the need for rights holders to increase their vigilance. 1. Always your mind on who you are—not what you are doing. The first thing to understand is that Star Wars fandom is a diverse place, and not all tributes are created equal. Who is making the tribute matters, and it’s the first question to ask when considering the likelihood of encountering a legal issue. A common rejoinder I hear from corporate clients when urging caution on this issue is, “Everyone else is doing it, so why can’t we?” While it’s true that Star Wars references are everywhere on May the 4th, there’s a big difference between a diehard fanboy celebrating the day by tweeting a picture of him and his friends dressed as Jedi; and a retail chain sponsoring a contest urging its employees to do the same. There’s a good chance the latter would be considered commercial speech, while the former almost certainly wouldn’t be. And that’s significant, because commercial speech (the legal term for advertising) is subject to a higher level of scrutiny than non-commercial speech. And for that reason, it involves more inherent legal risk. Without going into detail here about where the line between commercial and non-commerial speech gets drawn, because it isn’t always clear (if you’re interested you can read more about it here), rest assured that all May the 4th tributes, and all speech in general, assumes one of these two forms. And nine times out of ten your organization’s public communications, whether you regard them as “advertising” or not, will be considered commercial speech. 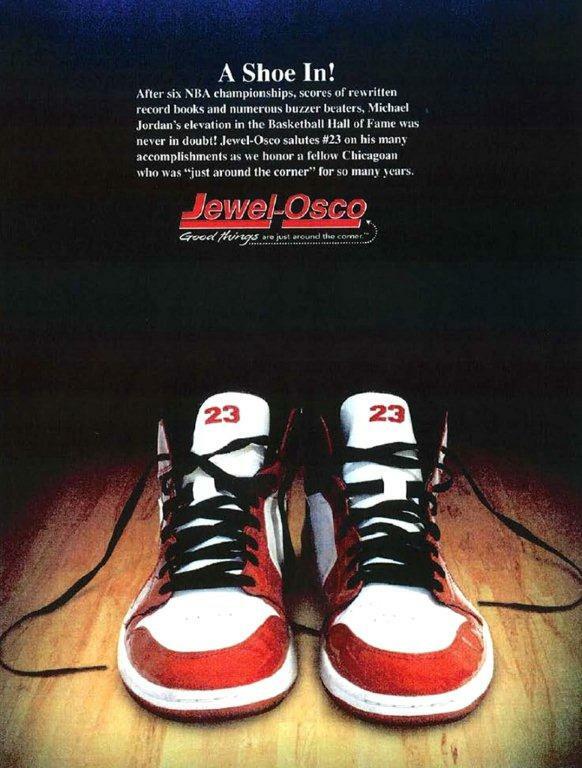 Just ask the supermarket chain Jewel-Osco, who unwittingly violated Michael Jordan’s rights when it took out a full page ad in Sports Illustrated to congratulate the basketball legend on his induction to the Hall of Fame. Public tributes—whether directed at sports celebrities or movie franchises—will be treated as advertising when they’re made by commercial enterprises. It doesn’t matter whether there’s an overt sales message or not. In other words, it’s not the message that matters most, but the originator of that message. Legal classifications aside, because fan engagement can enhance the brand value of movies, studios tend to look the other way when it comes to the individual creative expression of fans; even when that expression may establish clear grounds for an infringement claim. Lucasfilm understood this, and make no mistake about it, Disney does too. Disney won’t waste its time, money and reputation filing lawsuits against Star Wars fans absent a very compelling reason. What they most assuredly will do, though, is tirelessly defend any unauthorized commercial uses of their property—and justifiably so. Disney is a company whose worth is measured by the value of its portfolio of intangible assets; a portfolio amassed in large part through third party acquisitions (ABC, ESPN, Pixar, Marvel and now Lucasfilm). The assets in that portfolio are worth billions (Disney reportedly paid more than $4 billion for the Lucasfilm properties alone), so the idea that Disney won’t rigorously protect its newly acquired assets from uses it deems harmful is wishful thinking. That isn’t to say Disney intends to crack down on every corporate May the 4th tribute incorporating an unlicensed Star Wars trademark or copyright-protected element. But it does mean the company has every incentive to closely monitor how some of its most valuable properties are being used by commercial third parties. 2. Trademarks: avoid confusion, you must. Trademark law exists, first and foremost, to protect consumers from confusion over the source of goods and services. And the Lanham Act, the heart and soul of trademark law in the U.S., extends that protection to confusion about affiliation, association or sponsorship; each considered a type of unfair competition. Therefore, a concern with any corporate send-up is that an unlawful association will be drawn between the brand making it, and the brand or persona being referenced—no matter how innocuous the intent behind that reference may be. This is why Michael Jordan won his case against Jewel-Osco. By merely placing its logo next to his #23 sneakers, the company impermissibly linked its brand to his fame, implying a connection or endorsement between the two that didn’t exist. And one that, if it did exist, Jordan could have expected to be compensated for. Just like Mike, Disney makes a lot of money licensing its name and properties. But even His Airness can’t hold a candle to Disney’s prowess in the licensing department. According to License! Global, The Walt Disney Company was the number one global licensing company in 2013, racking up nearly $41 billion in licensing revenue. And with the first of five planned Star Wars sequels set to hit theaters this December, Star Wars promises to contribute a much larger percentage to that total in 2015 and beyond. Already we’re seeing corporate partners signing up to share in the Star Wars revival. And not just long-time franchise licensing partners like Hasbro, Lego and Mattel; but newcomers like ANA Airlines, Electronic Arts and SMS Audio. All this leaves little wonder why Disney might not be ready to openly embrace companies linking their brands to their newly-acquired cash cow without permission. So for trademark purposes, a permissible tribute does not attempt to reproduce or recreate any Star Wars logos, or even directly mention the names of trademarked characters. Any references to that galaxy far, far away tends to be indirect and implicit. A tribute can evoke the spirit of Star Wars by hinting at its themes, but it shouldn’t make overt use of any trademarks, which might lead to an implied association. That’s the path to dark side of infringement. 3. Let’s just say you’d like to avoid any…copyright entanglements. That brings us to the other body of law that can trip up the unwary marketer: copyright law. It’s no secret that copyright protection is something Disney takes very seriously. It was Disney, after all, who in 1998 lobbied hard to have Congress extend the term for copyrights in the United States to 120 years after a work’s creation, or 95 years after its publication (it had previously been 75 years), leading many to refer to the Copyright Term Extension Act as the “Micky Mouse Protection Act.” The effort was primarily a tactic to forestall the entrance of Disney’s earliest animated films into the public domain. But it still branded the company as an evil empire bent on suppressing individual expression. It’s a reputation that lingers today, and has caused many Star Wars fans to express vocal concern about losing the artistic freedom they enjoyed under the Lucasfilm regime. In other words, Lucasfilm didn’t pull people’s arms out of their sockets when they copied. Disney is known to do that. Not all copying is infringement though. There are major exceptions to a copyright holder’s exclusive rights, and those exceptions form the basis of the copyright doctrine of fair use. As long as a use is considered a fair use, then it doesn’t constitute infringement. So when making a tribute, an understanding of what makes a use fair is the key to avoiding a letter from Disney’s legal department. There are four factors that determine whether a use is fair or not. No single one, in and of itself, qualifies or disqualifies fair use. Instead, they are all considered as a whole in light of each unique set of circumstances. So the more of them you can successfully argue in your favor, the better. The purpose and character of a use: Has a work been “transformed” into something new by adding expression, meaning, insight or understanding? Parodies, satires, criticisms, critiques and commentaries of copyrighted works are usually considered transformative, as are uses for scholarship, research and education. The nature of the copyrighted work: Fact or fiction? Works of fiction are generally given more protection than works of non-fiction, since facts alone cannot be copyrighted. The amount and substantiality of the portion taken: How much of the work are you taking? Generally the less you copy, the more likely it will be considered a fair use. However, even a de minims use can be considered infringement if what you’ve copied is at the heart of the work. The effect of the use upon the potential market: Does your use of the copyrighted material deprive its owner of income? If your copying has a negative economic effect on the market—or even a potential market—for the original, then fair use is less likely to apply. The tech company’s tribute takes a quintessentially Star Wars theme—father versus son—and puts an entirely new spin on it; transforming it into social commentary on the evolution of computing, and it does so in an original and humorous way. This is exactly the type of expression (parody) that fair use was deigned to protect. In fact, the line “I am your father” is probably the second most parodied movie line of all time. Right behind “I’ll make him an offer he can’t refuse” and right ahead of “We’re gonna need a bigger boat.” Yes, it does make verbatim use of a line of dialogue directly from the Empire Strike’s Back; but four words taken from a two-hour movie are not likely substantial enough on their own to disqualify fair use—even if they are four of its most memorable ones. As for the negative effects on the market for Star Wars products, it strains the imagination to come up with any in this case. In fact, the additional exposure a brand like Microsoft gives Star Wars is likely to enhance its appeal from the box office to the toy aisles. The only market this tweet potentially harms is the one for zip discs—one I doubt Disney has designs on entering any time soon. This is a fact that many brands making similar tributes this May the 4th will point to for legal justification. With few exceptions, corporate tributes do not, from a copyright fair use standpoint at least, damage the market for Star Wars movies, toys, video games and apparel. If anything, they add to the aura of the brand and the universality of its appeal. Star Wars is of course a fictional work, so it’s got that working in its favor, but the other three factors weigh so heavily in favor of a finding of fair use that this would likely be inconsequential in any hypothetical analysis. Conclusion: You don’t need to seek their permission. This isn’t the infringement your looking for. Move along. Returning to the question, “Everyone else is doing it, so why can’t we?” the answer is: you can. Just understand that most who do it are doing it within the confines of the law. For those who aren’t (and there are some) there are three possibilities: They don’t know that what they’re doing is problematic, they don’t care, or they have permission to do it. That last point shouldn’t be lost. Many of the Star Wars tributes out there are from licensed Disney partners who have agreements in place permitting them to do things with Star Wars properties that others cannot. For the rest of us, we have to color inside the lines drawn for us by copyright, trademark and unfair competition law. But if you have a great idea for a May the 4th tribute that you suspect might be edging dangerously close to a line, then you might consider seeking permission. Disney has an entire legion of its best men awaiting your permissions requests, and you can reach them on their comlinks here. In the world of intellectual property, unlike in some others, it’s usually easier to ask for permission than it is to seek forgiveness. So this May the 4th, before you run your wookie-themed social campaign, or sponsor your own reenactment of the Kessel Run, take a minute to pause and consider the legal implications; perhaps even involving an intellectual property expert when developing your creative product. If you do not and you choose the quick and easy path, as some do, then an unwitting agent of infringement you may become. Thanks – an excellent summary of many of the issues to consider with regards to trademarks and copyrights, especially in an age when infringement is a click away! Consult a patent attorney when you get inclined to do things that you wouldn’t be happy about if you were in Walt Disney’s shoes. “zip discs”? How old are you? Just teasing. Thanks for the guide. So from what I read above, using the phrase “come to the dark side, we have …” (with any number of things used at the end), even if printed in the “Star Wars” font, isn’t a copyright infringement? I feel like there is a real estate agent in Madison Alabama who is violating the trademark. His billboards as well as Facebook is relating to Star Wars. Who would I contact about it? I had a recent argument with a Jedi religious forum because I had the audacity to ask Lucasfilm instead of going through the ranks one of their churches eventually setting up a local chapter if i wanted to engage with people locally.